Highly detailed small artwork of the script “Stingray Corvette” in chromium effect, with surrounding ‘barbed wire’ artwork encompassing the highly detailed C3 corvette racing flags. Subtle pin striping finishes off this detail nicely, with a dark grey shadowing effect of the artwork in the background. 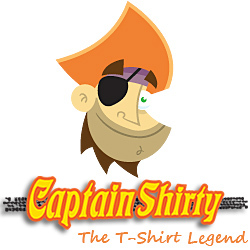 Note; there is no image of the car on the front of the Tee. 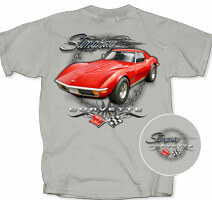 The main detailed artwork on the back of this Tee is of this gorgeous C3 generation, 1970 Corvette sports coupe, by Chevrolet. The artwork of this sharp ‘high gloss’ red coupe beauty is a true muscle car of the early seventies. The highly detailed artwork identifies the era correct front facia grille assembly with correct turn signal indicator detail and chrome bumper bar assembly. The details extend to the period correct and highly detailed steel rally rims and wheel cap details, the aggressive tread pattern of the tyres, with the ‘egg crate’ grille like flutes in the front guards. The chrome body work detail such as the side view mirrors, chrome door latch assembly and interior detail is fantastic and fresh. The scale and detail of this artwork is brilliant and accurate, just simply stunning, muscular and collectible for this period model Corvette. In 1970, fender flares were designed into the body contours to reduce wheel-thrown debris damage. New were egg-crate grills with matching front fender side vents and larger squared front directional lamps. The previously round dual exhaust outlets were made larger and rectangular in shape. Interiors were tweaked with redesigned seats and a new deluxe interior option combined wood-grain wood accents and higher-spec carpeting with leather seat surfaces. Positraction rear axle, tinted glass, and a wide-ratio 4-speed manual transmission were now standard. The 350 cu in (5.7 L) base engine (ZQ3) remained at 300 hp (224 kW) and the L46 was again offered as a 350 hp (261 kW) high performance upgrade. New was the LT-1, a 350 cu in (5.7 L) small-block V8 engine delivering a factory rated 370 hp (276 kW). It was a solid lifter motor featuring a forged steel crankshaft, 4-bolt main block, 11:1 compression ratio, impact extruded pistons, high-lift camshaft, low-restriction exhaust, aluminum intake manifold, 4-barrel carburetor, and finned aluminum rocker covers. The new engine, making up less than 8% of production, could not be ordered with air conditioning but was fitted with a domed hood adorned with “LT-1” decals. The background art of the Tee is simple, showing subtle pin striping effects, with ‘barbed wire’ artwork with grey shadowing effect of this artwork in the background. The crossed Chevrolet racing flags are seen displayed in accurate detail and colour scheme at the bottom of the main artwork, with the script ‘CORVETTE’ slightly above the flags in ‘chromium effect’ detail. As is the script ‘Stingray’ at the top of the main artwork. Tee shirt Colour: Available in Ice Grey only, complete with genuine GM official licensed product tag.